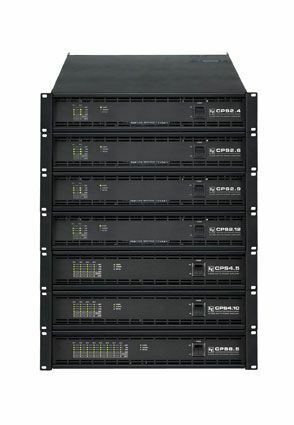 New for InfoComm 2009, Electro-Voice (Booth 6100) will launch seven brand-new models of CPS amplifiers, targeted at the pro audio installation market. The new series comprises four two-channel models based on Class-H design and three multi-channel Class-D type amplifiers, all housed in 2U chassis, with euroblock-type connectors on inputs and outputs. The two-channel models feature switchable hi-pass filters and bridgeable output channels. The multi-channel amplifiers’ direct-drive design allows for switchable output characteristics from Low-Z to Hi-Z for each individual channel, ranging from 2 ohms load up to 100V line drive. In addition, channels can be bridged for double output power. All amplifiers provide module slots for optional RCM-810 modules that can be retrofitted for remote control and supervision via IRIS-Net. Additionally, the multi-channel models CPS4.5, CPS4.10, and CPS8.5 feature Variable Load Drive technology (VLD), providing maximum power output into any load between 2 ohms and 10 ohms, scale-able in steps of 0.1 ohms when remote controlled by IRIS-Net via the RCM-810.